Dating back to the early 1980s, the sheriffs salaries was established in the Appropriations Act to provide the newly elected sheriff would make the same salary as the former sheriff that was either defeated or retired. The Association maintained then that the qualifications for sheriff were decided by the people, not a state agency. Accordingly, all sheriffs make the same salary based on their qualifications as elected not necessarily by their seniority, as a result of legislation secured by the VSA. The Association has been the driving force in improving salaries and working conditions of sheriffs, deputy sheriffs and support staff. During every session of the General Assembly, the Association is sponsoring budget amendments, bills or other activities to fund salary increases for sheriffs including the 9.3% for sheriffs receiving accreditation or the 6.2% increase for sheriffs receiving certification, the master deputy plan provides a 9.3% increase for deputy sheriffs for up to 20% of sheriff’s offices that meet certain criteria, and as a sponsor of salary increase amendments and bills for support staff for sheriff’s offices. This is an ongoing effort and will continue to be addressed by the Association. The VSA was the driving force in the passage of legislation that requires a referendum approved by the voters prior to a county creating a police force. In the early 1980s, counties would routinely create police forces stripping the sheriffs of their law enforcement responsibilities. Their have been a number of referendums, and most have been killed by the voters when they find out that the people no longer have the opportunity to choose their chief law enforcement. The requirement for the referendum was the results of legislation secured by the VSA. 1 deputy sheriff for 1,500 population – The VSA began efforts on this in the early 1980s and finally succeeded in the mid-90s when the Governor introduced a budget that included funding for 1:1,500. Several bills had passed either one house or the other but none had passed both houses prior to that. After the funding was included in the budget, the General Assembly acted favorably and amended the Code requiring one deputy sheriff for 1,500 population for law enforcement. The VSA was active in an amendment to the Virginia Constitution to provide that drug asset forfeitures can be used for law enforcement. An amendment to any constitution is a daunting task. A bill must pass two consecutive sessions of the General Assembly without a letter or word change with an intervening election of at least the House of Delegates, then the people of Virginia must vote for the constitutional amendment. This was the success of the VSA – to allow drug asset forfeitures to be used for law enforcement. Prior to the constitutional amendment all drug asset forfeiture went to the literary fund. Now sheriff’s offices routinely share in the assets of drug dealers because of this constitutional amendment. The VSA secured passage of minimum qualifications for law enforcement officers in the early 1990s. While the minimum qualifications are considered by many to be minimal, it was a giant step forward at that time and received significant opposition in the Virginia General Assembly. The bill passed requiring at least a high school education, a background investigation, citizenship, a records check, and a physical prior to an appointment of a deputy sheriff. The VSA secured passage of legislation providing for legal defense of sheriffs and deputy sheriffs made parties to a civil suit in the event that there is no coverage by an insurance company. A similar section was also enacted to provide reimbursement to sheriffs and deputies in the event they are accused of criminal activity and exonerated for accusations of criminal conduct arising from the performance of their duties. The key word here is they must be exonerated of all wrong doing before receiving the benefit under this section of the Code. The VSA, as you know, this year has been instrumental in adopting improved staffing standards for sheriff’s offices. The committee has worked nearly two years to address recommendations submitted by sheriffs relating to staffing and has recommended to the Compensation Board staffing standards for sheriff’s offices and staffing standards which the committee felt should be funded by the Commonwealth. The VSA has, during the past two years, implemented a courthouse and courtroom security assessment program which was initiated by the chief justice of the Virginia Supreme Court, Leroy Hassell. To date, 53 sheriffs have received security assessments for their courthouses. The Association has used the services of the Virginia Center for Policing Innovation to assist with this important effort. One of the major accomplishments of the Association is to provide increase retirement benefits for our deputy sheriffs and sheriffs. 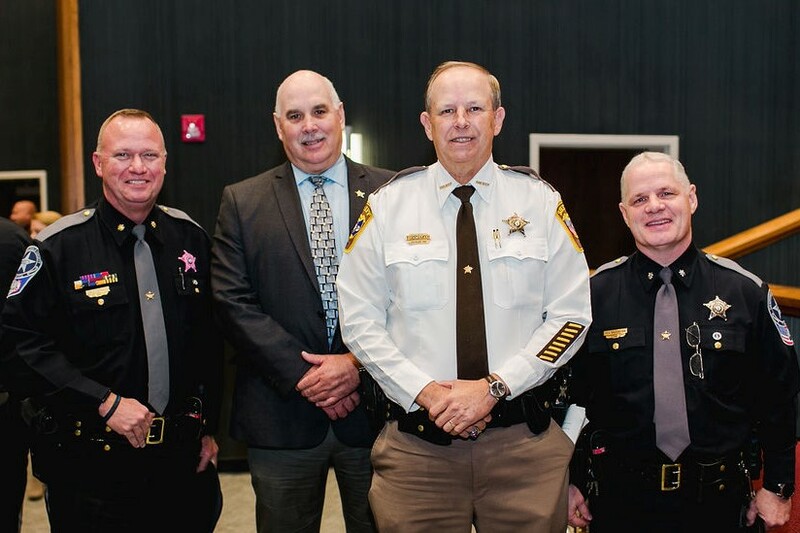 During the 2007 Session of the General Assembly, the Association was finally able to accomplish LEOs benefits for all deputy sheriffs and the option of the 1.85% multiplier for all deputy sheriffs if approved by their locality, and sheriffs. Many thought that this was not possible and a number of sheriffs suggested that we move on with our legislative priorities; however, staying on course resulted in this tremendous benefit requiring localities to pick up the cost of LEOs. Most recently the Association has been involved in legislative success after success. Often times it is just as important to kill bad bills as it is to pass good ones. For example, during the last Session of the General Assembly, a number of bills were passed and a number of bills were killed because you, our members, took time to call your legislator or visit your legislator as requested by the Association lobbyist and executive director. These accomplishments and issues are highlighted because it is important to know that when the sheriffs unite together, we accomplish much. If members become fragmented or divided, the VSA then becomes easy to conquer. Our next major initiative has to be preservation of the prominence of the sheriff’s role in managing local jails. During the 1980s the General Assembly passed legislation providing 50% funding for construction, expansion and renovation of regional jails and 25% for local jails. Everyone presumed the regional jail concept was designed to serve small, rural areas that could not justify small jails based on the economies of scale. The 50% reimbursement has served Virginia well and resulted in a general improvement of the overall ability of jail beds at the local level. However, this concept has been high-jacked to promulgated regional jails in large cities and counties in order to secure the 50% funding at the determent of the sheriff’s office. The construction, expansion and renovation reimbursement should place sheriffs on equal footing with regional jails. This should be the top Association priority this year and in the coming years of the General Assembly until it is remedied.